Here's a treat for everyone: on Tuesday, Empire released new photos from the upcoming DC Comics film Batman Vs. Superman: Dawn Of Justice, including a new photo of Jesse Eisenberg as Lex Luthor... but he's not bald. The stills from the 2016 sequel to Man Of Steel offer glimpses at Batman's (Ben Affleck's) industrial, armored batsuit; Superman (Henry Cavill) standing in a dilapidated Wayne Manor; and, most exciting of the sneak peak, Jesse Eisenberg as a young, hip and with-it Lex Luthor at LexCorp. He's a superhero villain for this crazy digital-age of ours, a very young, very rich Silicon Valley-esque CEO. In the photo, Luthor stands casual and chill on the in-house basketball court at LexCorp, a Google-style venture in the new film. He's wearing jeans and a tee. But there's one thing that's puzzling folks about new Lex Luthor: that, instead of being bald, he's got shoulder-length, devil-may-care red hair. Twitter is like, what gives? Even I bristled at the typically bald-Luthor character being shown with hair. 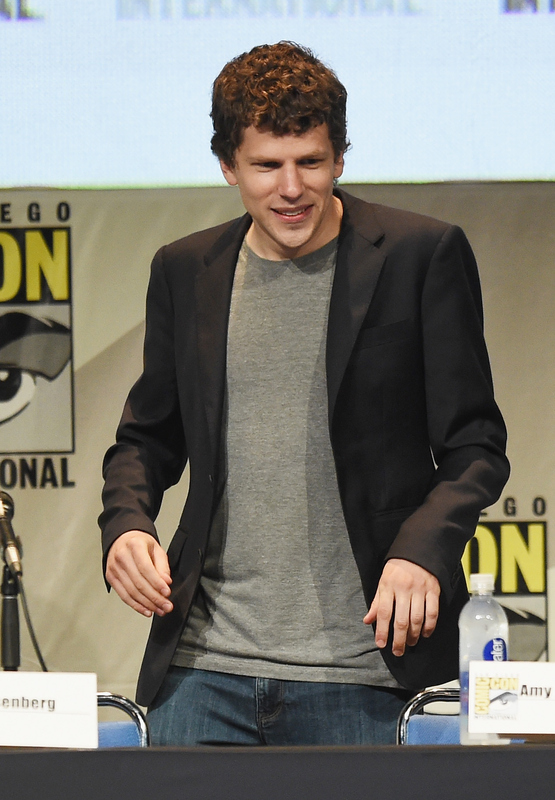 Like, is this just a photo of Eisenberg at home that accidentally got swapped in with a film still? And didn't we see a pic in Entertainment Weekly that showed Luthor sans 'do? Naturally, Twitter is asking the right questions about the very luscious locks that Lex is sporting in this photo. And a lot of people think Eisenberg is just recycling his Mark Zuckerberg character from The Social Network to play the villain (not entirely unwarranted, if you ask me). But others are intrigued. Even excited. So why isn't Lex bald in the new still from Dawn Of Justice? Calm down, everyone: we will get a cueball Lex at some point in the film. In fact, the very first look we got of Eisenberg as the villain was his extremely shiny dome on the cover of Entertainment Weekly, which itself prompted some very emotional reactions on Twitter. So why does Lex have hair in this new photo? It's all for character development, baby; as the Empire report says, "Like Professor Xavier in X-Men, the hair gets its own arc in this franchise." Lex wasn't always bald, just like he was not always evil. It's like, totally symbolic. There have been a lot of different story-lines about how Superman's arch-nemesis lost his hair throughout the years. The original Lex origin story from Adventure Comics in 1960 has him tragically losing his hair in a fire in his laboratory while trying to develop a cure for Kryptonite for Superboy, who was then his friend. Others explain his baldness as hereditary, but I'm guessing Eisenberg's young, hip techie isn't going to lose his hair from old age. So don't worry, fans! There will be bald Lex! It'll just take a minute.